County commissioners have approved an Economic Development Corporation loan in the amount of $29,000 for a new Christian bookstore in Lewiston. The matter was discussed at the April 10 regular county board meeting. Some commissioners pointed out past issues with the EDC, including failed businesses, but Phil LaMore, board member for the EDC, assured the commissioners new procedures are in place for monitoring loan payments and business success that will reduce the chance for failure. “We’re looking to protect the county’s money and the community’s money as best we can and move forward with what we want to do…,” LaMore explained. In a related matter, the county board approved paying Jodi Gordon, who is leaving the position of EDC administrator, $250 to help process the loan for the bookstore. Linda Uchwal, who is taking over as administrator, is still in the process of being trained for the position. July 4th weekend festivities in Hillman include a fundraiser for Wings of Mercy, which will take place at the airport in Hillman. At the Village of Hillman council meeting on April 2, council members approved use of the airport for a 5k run and fly-in for July 5-7. Dave Morrison, Gaylord, told council members hangar owners and Mark Mellingen, airport manager, are involved in planning the event. Wings of Mercy provides transportation to distant medical facilities for patients who cannot afford to fly. Pilots have flown about 8,000 missions, so far, on behalf of patients in need of transportation. The pilots are volunteers, and 80 percent of donations go to sustaining flight costs. Also concerning the airport, David Post, village manager, told the Tribune the airport will likely have to be shortened by about 400 feet on the south end for clearance purposes. Arrangements have been made with property owners on the north end of the runway for trimming of trees to allow for landing clearance, but property owners on the south end of the runway have been difficult to contact. Post assured, after shortening the runway, the runway will still be in excess of 2,000 feet. On another topic, council members adopted a budget that reflects $959,773 in expenditures. The expenditures include $352,247 for the general fund, $101,000 for major streets, $69,500 for local streets, $52,344 for the Hillman Economic Loan Program, $63,632 for bond debt, $7,000 for the airport, $85,500 for the sewer department, $110,000 for the water department, $84,000 for the cooling pond and $34,000 for the heavy equipment pool. According to Post, the projected revenues for the coming year are slightly more than the projected expenditures. The revenues include $175,000 expected from collection of 9.7538 mill for the fiscal period from April 1 of 2019 through March 31 of 2020. The pitching battle between Hillman’s Bailey Schook and Pellston’s Madison Brown on April 10 ended in a tie, and that’s the way the referees left it. With cold temperatures, strong winds and the second game of the double-header still to go, the game was called after six innings at 3-3. Pellston’s Lady Hornets took a one-run lead in the top of the second inning and stranded two Hillman runners in the bottom. Schook walked the first batter in the top of the third, but three consecutive strikeouts left the runner with nowhere to go. Then, Hillman’s Lady Tigers went to bat. Hillman’s Briley Tyler won a full count with a walk, and Schook followed with a single. Alison Samp walked to load the bases, and Tyler stole home to tie the game at one. A single and two RBIs for Ariana Smith put the Tigers up by two going into the fourth. With two on and one out in the top of the fourth, the Hornets scored on a groundout to come within one run. Another runner stole home to tie the game at three. Schook walked two in the top of the fifth, but two strikeouts and a groundout ended the threat. With one out for Hillman in the fifth, Samp doubled on an error. With two outs, Smith was hit with the pitch to color the corners, but a flyout left the score knotted. Schook struck out Pellston’s first three batters in the top of the sixth, and all the Tigers needed was one run. Howling from the Tiger dugout ensued as Melanie Morrison went to bat, but she was tagged out on the way to first. Mackenzie VanPamel grounded out, but cheers from the dugout resumed as Brooke Grulke eyed a walk on a full count to give the Tigers hope. Tyler made contact but grounded out, leaving the game tied at three. McKenna Hively was Hillman’s starting pitcher for game two, which ended 12-8 in favor of Pellston. current and past issues of the Tribune. Go to our sign up page. Want To View More News From The Montmorency County Tribune? 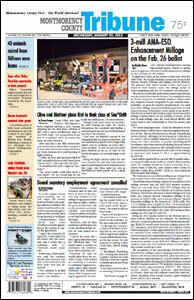 The Montmorency County Tribune is available in a digital format to our subscribers. This Digital Edition of the Tribune is available each week by Wednesday. It provides a convenient way for out of town readers to catch up on the news from Montmorency County without waiting for mail delivery. It is also great for readers in the armed forces and others who live overseas. The Digital Edition is free to print subscribers, or can be purchased for $20 per year without a print subscription. Visit our subscribe page to sign up for the Digital Edition, or to find information on purchasing a print subscription to the Tribune. If you purchase a subscription to the paper, or even just a digital edition subscription, you be able to view full obituaries, sports stories, news, classifieds and more! To read our newspaper online, you will need the Adobe Reader, which is a free download. The Adobe Reader enables you to view .PDF files, which is the format that our newspaper is saved in. If you do not already have the Adobe Reader installed on your computer, just CLICK HERE to download it for free. A new window will open up that contains the link to download the program and installation instructions.